Guard Christorr Stuart (188-G) put on an amazing game in the last round for Pirates and receives a Interperformances Player of the Week award for round 12. He had a double-double of 33 points and 13 rebounds, while his team beat Pros (#9, 1-11) 100-95. Pirates maintains the 7th position in Bahamas league. Pirates is rather a weak team placed in lower part in the standings. They need more victories to improve their 4-8 record. In the team's last game Stuart had a remarkable 52.4% from 2-point range. He turned to be Pirates' top player in his first season with the team. Stuart has impressive league stats. He is in league's top in points (6th best: 18.4ppg) and averages solid 2.5spg and 50.9% FGP. Second best performed player last round was Kemsy Sylvester of Bahamas Univ.. He is a in his first season at Bahamas Univ.. 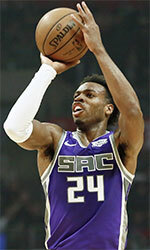 In the last game Sylvester recorded impressive double-double of 32 points and 21 rebounds. Bad luck as Bahamas Univ. lost that game 71-91 to slightly lower-ranked Shockers (#5, 6-6). This loss caused Bahamas Univ. to drop to 4th position in the standings. His team's 8-4 record is not bad at all. 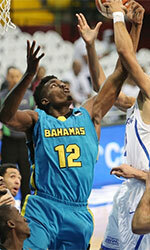 Sylvester is a newcomer at Bahamas Univ. and quickly became one of team's most reliable players. He belongs to the best scorers in the league with 21.9ppg (#2). His other stats are also decent: 9.8rpg and 4.1apg. Third place about best performers goes to Colton Albury of Pros (#9). Albury scored 27 points and grabbed sixteen rebounds (!!!). Despite Albury's great performance Pros lost 95-100 to slightly higher-ranked Pirates (#7, 4-8). But his team cannot count on just a single shooter as he also needs help of the other teammates. Pros can only dream about fighting for top spots in the league. They have extremely bad season and 1-11 record places them at the very bottom of the standings. Too bad for Albury he does not play for a better team. But maybe if he did, his season stats would not be that high. Albury has individually a great season in Bahamas. After 12 games, he made it on the list of the league's leaders in points with 25.4ppg (best scorer) and rebounds with 11.0rpg (4th best).